Cruising the Internet the other day, the Accidental Locavore came across a discussion about chive blossom vinegar. Like tarragon or other flavored vinegars, it’s super-easy to make and will give a lovely, fresh taste to salads. Added bonus: it’s really beautiful, isn’t it? I probably went overboard and beheaded all my chives, but you can do it with only a handful of blossoms. I recycled this bottle (and pushed the blossoms through with a chopstick), you can use any jar or bottle, just run it through a hot dishwasher to sterilize it. 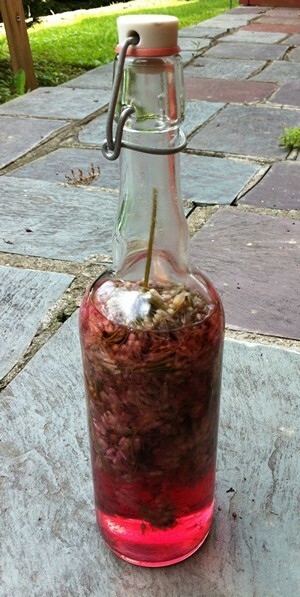 Put the chive blossoms in a clean bottle or jar. In a medium saucepan, heat the vinegar to a simmer. Pour the vinegar over the blossoms (you may want to use a funnel). Cover and let sit for a week to let the flavors develop. Serve and enjoy! To make tarragon vinegar, do the same thing with a big sprig of tarragon and cider vinegar. It’s great with chicken or in place of the lemon in mayonnaise. My chives are ready to use now. 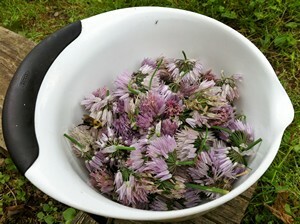 I will wait for the flowers and make the chive vinegar. Thanks for the ideas. What a fantastic idea! I’m cross because I cut back my chives last weekend and composted the flowers! Next year I will definitely make this vinegar. Thanks for the recipe. boy, just in time!! have been putting off dead-heading my chives, and now i know what to do with them. as for tarragon vinegar, i use lots of sprigs: it ends up very strong, and guess what…..it lasts forever. it’s especially useful for the acid in your tarragon mayo. that, plus tarragon mustard and lots of chopped fresh tarragon, is killer. perfect with lettuce in a chicken sandwich. I have tons. I mention some in my headnote! Now we just have to come up with the most interesting use for it! Previous post: The Accidental Locavore-Back In Business With a New Farm Box!